KAMPALA, Mar 13 2014 (IPS) - Human rights campaigners who filed a recent legal petition against Uganda’s draconian anti-gay law believe that they have a compelling case for its nullification. “Judges are human beings. But we are pretty sure we have made a compelling case for the nullification of the law and the judges will exercise their judicial minds to the law as presented before them [rather than pay attention to] public sentiments,” Secretary of the Uganda Law Society, Nicholas Opiyo, told IPS. On Tuesday, Mar. 11, a coalition of campaigners filed a petition with Uganda’s Constitutional Court in Kampala in response to the Anti-Homosexuality Act 2014. President Yoweri Museveni signed the bill into law on Feb. 24. The law strengthens penalties for homosexual acts, prescribing life imprisonment for “aggravated homosexuality” and criminalising the “promotion” of homosexuality. The team is seeking an injunction against the enforcement of the law. The petition was filed under the auspices of the Civil Society Coalition on Human Rights and Constitutional Law (CSCHRCL), a coalition of 50 indigenous civil society organisations advocating for non-discrimination. The petitioners are also seeking a permanent injunction against media houses or any other organisations from publishing pictures, names, addresses or other details of lesbian, gay, bisexual, transexual and intersex (LGBTI) or suspected LGBTI persons. On Feb. 25, just one day after Museveni signed the anti-gay law, Ugandan tabloid Red Pepper published a list of what it said were “Uganda’s 200 top homos”. A string of other sensational headlines in other editions of Red Pepper, and another tabloid Hello, ensued. 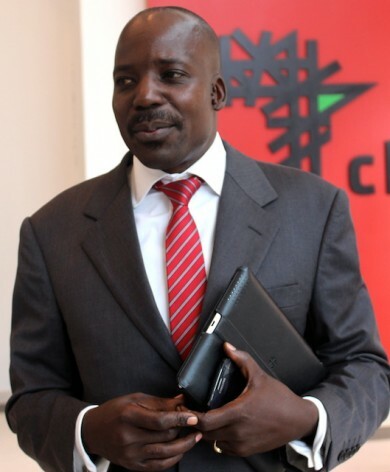 Geoffrey Ogwaro of CSCHRCL was named in a Mar. 1 issue of Red Pepper, which carried the front page headline “Ugandan homos form cabinet”. His photo was featured on page two. Although the activist’s immediate family knowns that he is gay, he said his mum was still “heartbroken” after being shown the paper. “She’s never really come to terms with it and when it became public it was really embarrassing for her,” Ogwaro said. “We are under no illusion that this petition is the most popular petition. We know too well that the general public may be adverse to our petition and will seek to vilify the petitioners and their lawyers,” Opiyo said. Among the petitioners is Fox Odoi, a ruling party MP and former legal advisor to Museveni who is the only legislator to speak out publicly against the law. “I believe it’s irrational, it has no basis, it offends every human right that you can think about, it offends our constitution. It offends our treaty obligations of Uganda,” Odoi told IPS about the anti-gay law. “Personally I do not agree that we’re going to lose in the Constitutional Court and the Court of Appeal… We have a good case,” Odoi said. Other petitioners include law professor Joe Oloka-Onyango, media personality Andrew Mwenda and former leader of the opposition Professor Morris Ogenga-Latigo. A number of distinguished gay rights campaigners and Ugandan NGOs Human Rights Awareness and Promotion Forum (HRAPF) and the Centre for Health, Human Rights and Development (CEHURD) are also named in the petition. Adrian Jjuuko, executive director of HRAPF, said there had been 10 cases of arrests of LGBTI and suspected LGBTI people since the law was passed by Parliament in December. There were also more than three cases of evictions of tenants by landlords who did not follow due process of the law. Ugandan activists have vowed for years to challenge the law in court. Campaigners have already notched up two legal victories. In 2011 leading gay rights activist David Kato and two others won a case against now defunct tabloid Rolling Stone, which had called for homosexuals to be hanged. Weeks later Kato was murdered. In 2008 two lesbians, Yvonne Oyoo and Victor Juliet Mukasa, were awarded 7,800 dollars by a judge who found their rights were violated when the pair was arrested and one of them was undressed by police. Some activists are hopeful they could win again. “I think court could work out, it’s usually very objective. It has been very objective in the other two cases that have been won,” Ogwaro of CSCHRCL said. The petitioners say that even if the Constitutional Court does not rule in their favour, it is not the end. “We shall appeal to the Supreme Court. Uganda is [also] a signatory to the law that establishes the East African Community, there is a court and we shall explore that option. We shall keep fighting,” said Odoi.